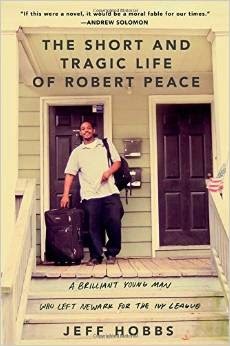 Recently I finished reading The Short and Tragic Life of Robert Peace. It is the story of a brilliant young African American man from Newark, NJ, who graduated from Yale, and then returned home. It tracks his experience living between very different American cultures. In a couple of ways, Robert Peace inspired my word for the year, ask. Though on the outside, he and I seem like we couldn't be more different, two aspects of Robert Peace's story strike home for me. One is that his elite education had drawbacks for him. As much as Yale opened doors for Peace, it also built a rigid model of expectations that structured Robert Peace's exterior and interior experience. Expectations about who he should be and what kind of work he should do constrained the potential vast range of his life. The world of ideas that he lived in for four years in New Haven was a stark contrast to Newark, irrelevant, even sometimes dangerous, in the context of his real life. And what was worse, though the cultural gap between Yale and Newark was real, there was shame and confusion for him in not being able to bridge it effectively. Palo Alto is no Newark, that is for sure. But, with regard to some of the mundane challenges of my own life--say caring for a colicky baby or encountering grief, my own education has sometimes felt extravagant and useless, like a Tesla abandoned in a redwood forest--no charger for miles. And this experience has often been accompanied by a wild shame--that I should have been more prepared, or I should have seen that I was unprepared, or I somehow should have known something that I didn't. I often look back in wonder and sadness that I spent most of my education mastering new information, very little time experimenting, taking risks, or visiting the emotional terrain of not knowing. The second way that Peace's story strikes home, and this is one, oddly, I think a lot of moms might relate to, is that Robert Peace was a giver. He tutored other families' children, he gave money to family and friends, he supported his mother, organized the legal defense of his incarcerated father, and in a lot of ways, spread himself thin on behalf of his community. By doing all of this, he created a social world that perceived him as competent, resourceful, and empowered. The reality was, his energy drained from his life. He failed to be honest with himself and with others about how low his own reserves were, and eventually this had a fatal cost. In these few ways, Robert Peace inspired me to take up the word "ask" this year. He showed me that giving can sometimes be a cover up for where we feel small and scared, where we need to reveal to the world that we are under resourced, need help, or simply don't know what to do next. And he reminded me that I am still learning about learning, that I still struggle with taking risks and not knowing. I am deeply grateful to the writer, Jeff Hobbs, for creating this work of non-fiction. This was a personal story for him: Hobbs was Robert Peace's white Yale roommate. He narrates a complicated story of race, class, education and poverty with clear sight and a big heart. I highly recommend it.